Excerpt from Vanessa’s Book: 101 Costly HR Mistakes and How to Fix Them! Whether the conduct is unwelcome and can be considered objectively hostile. As for (1), it is a good idea for employers to keep an eye out for seemingly unusual employee behaviors and actions. Inappropriate actions should be heavily documented. As for (2), it is recommended that employers seriously consider and investigate any complaint, report, or mention of conduct or behavior of which an employee feels uncomfortable. Because there is such a thin line between “just obnoxious behavior” and “illegal conduct,” employers should prevent questionable conduct, behaviors, and actions to avoid liability. 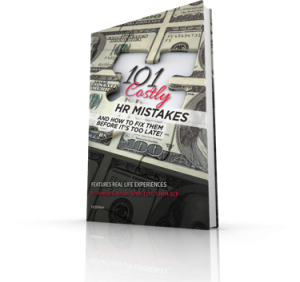 For more stories like this, you can purchase 101 Costly HR Mistakes…and How to Fix Them! by clicking here. Previous Previous post: Is Your Employee Turnover Caused by a Lack of Job Analysis?